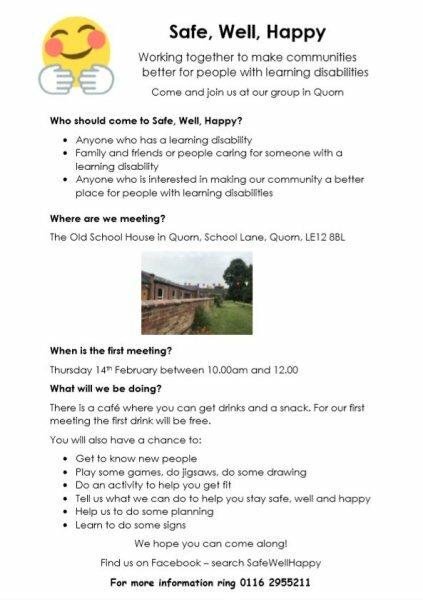 The Safe, Well, Happy group meets once a month at the Old School House in Quorn on the 2nd Thursday of the month from 10am to 12pm. The group aims to support people with learning disabilities with a friendly and sociable get together where there is the opportunity to be active, play games, learn new skills and share thoughts on how the group can provide further help. The group is supported by Leicestershire Partnership NHS Trust, Homefield College, Active Charnwood, Fusion Lifestyle, Charnwood Action Group, Mencap and many more partners. Find out news on the group in the closed Facebook Group, search for SafeWellHappy. For more information on the group ring 0116 295 5211.